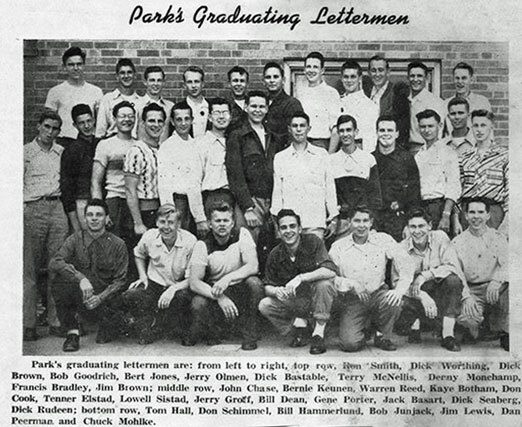 Achievements of Park grads are generally listed in this chronological listing in the year they graduated. In 1911 Bert Baston signed up for high school football at the age of 14. He became a two-time U of M All-American football end in 1915 and 1916. 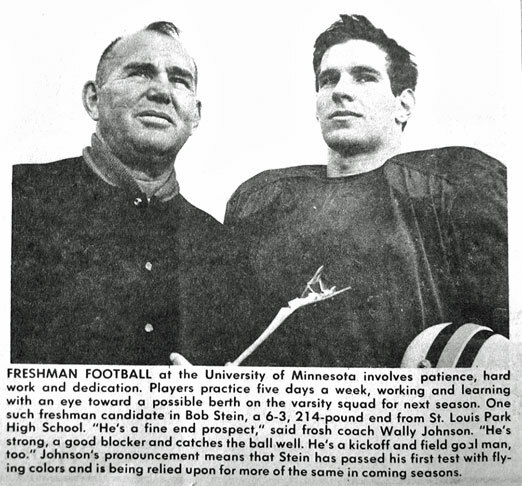 He was the first All-American from St. Louis Park and the first Gopher in history to be a repeat All-American. In 1914 Mr. F.M. 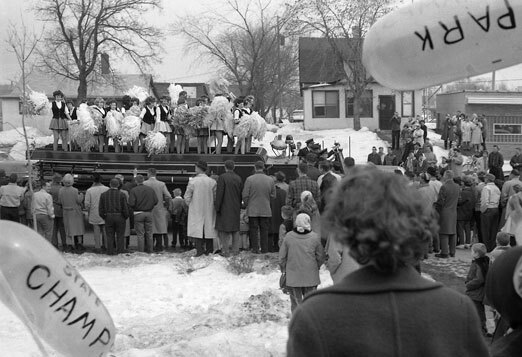 Moon, manager of the St. Louis Park Base Ball Club, convinced the Village Council to provide $50 to grade the Ball Park. In 1916 the baseball team was reimbursed $50 for their work on the ballpark. The team was still referred to as the “Parks” – Orioles were yet to come. 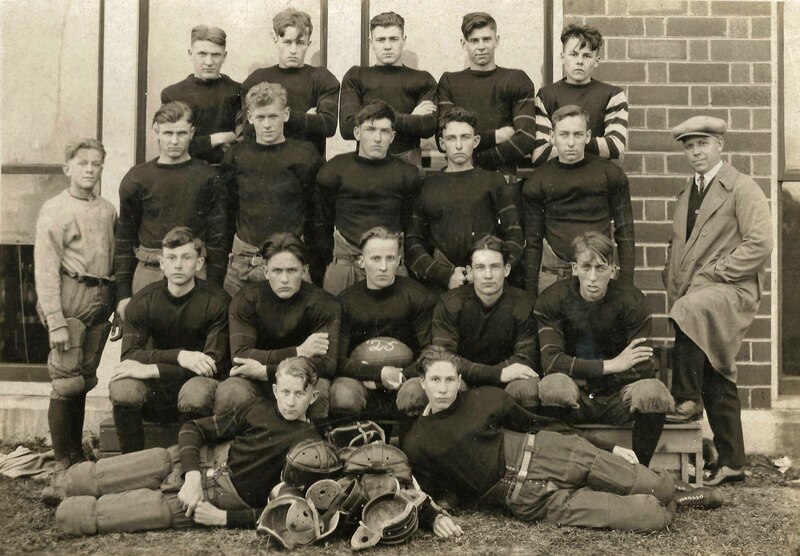 Above is the 1925 Football team, including Victor Howell, William Gamble, Lester Davis, N.H. McKay, Siegfried “Zock” Hartmann, “Hipe” Nelson, Parker, “Sunny” Peterson, Clinton Sewall, Bill Jaglo, David Henderson, “Fuzzy” Whalen, Stan Chelberg, and Clair Chamberlain. 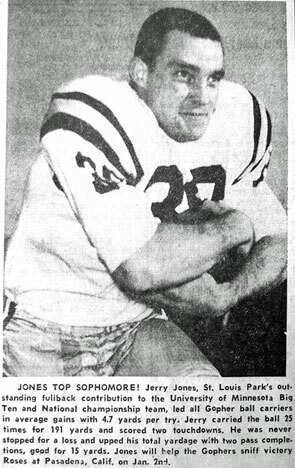 In about 1945 sportsman Jimmy Robinson moved to the area when the magazine he wrote for, Sports Afield, moved to Minneapolis. Robinson wrote for the magazine from 1927 until 1986, when he died at his home at 29th and Boone Ave. in St. Louis Park, where he lived for over 30 years. He was a a trap shooter and hunter who led many excursions with famous personalities like Ted Williams, Mickey Mantle, Clark Gable, and other actors and politicians. In 1955, 6 ft. 7 in. center Warren Jeppesen scored 47 points against Edina in an 86-67 victory, a new Lake Conference individual scoring record. Jeppeson made 17 field goals and 13 free throws. From 1964 until 1983 the Parkettes were cheerleaders for the Minnesota Vikings. Bob was a pitcher in Little League, and he was VERY fast and VERY wild. We all feared batting against him, because he was so fast and because you never knew if the ball would come in front of you or in back of you! Funny memory! Marc Trestman was a 1974 graduate who played college football and became the head football coach for CFL’s Montreal Allouettes. He also coached for the Vikings, North Carolina State, and the University of Miami. In September 2013 Marc was inducted into the St. Louis Park Athletic Hall of Fame. Comprehensive articles about Trestman’s career can be found in the StarTribune articles here and here and here. 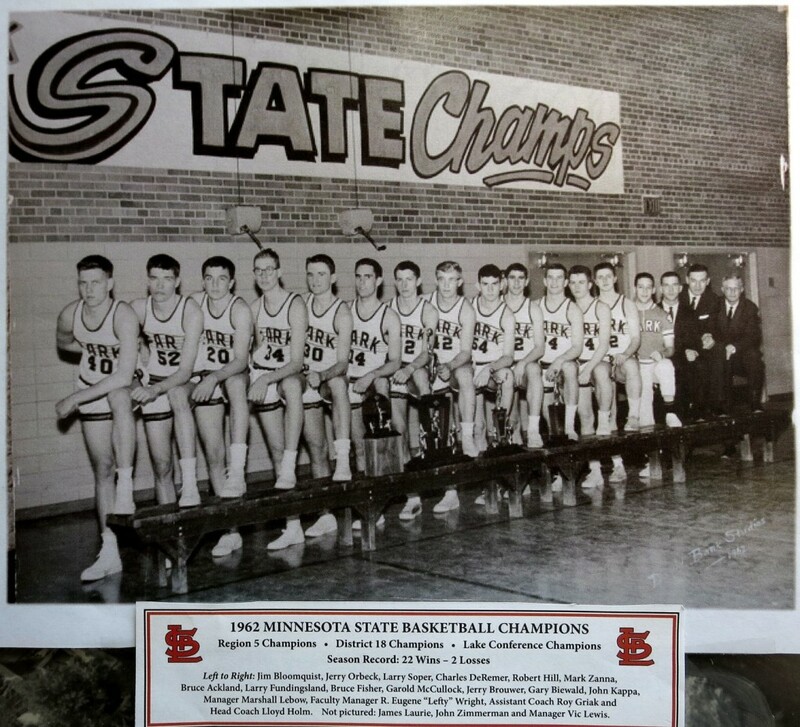 1975 grad Jeffrey Passolt played hockey at St Louis Park then went on to play at St. Cloud State for four years in 1977-80. He was inducted in the SCSU Sports hall of Fame and is FOX 9 News Lead Nighttime Anchor. 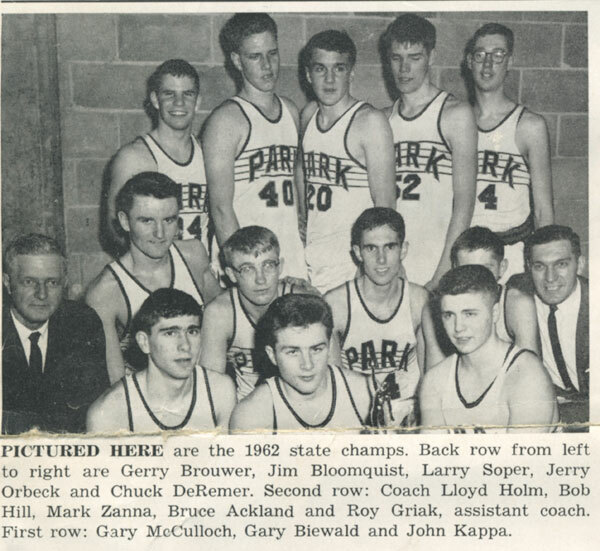 Park went to the State Basketball Tournament in 1979. The St. Louis Park Junior American Legion baseball team won the State Championship. The coaches were Fred Rose and Jerry Udean. Members of the team included Jeron Udean, Steve Rose, John Altemeier, Nathan Bryant, Sam Chauhan, Nick Skogman, Andrew Abruzeezee, and Jason Siegfried. There is a full roster from the billboard at the field by Peter Hobart. The State tournament was held at Carlson Field, here in St. Louis Park. Our winning team went to Bridgeport, Michigan, for the Junior Legion National tournament. In the fall of 2014 St. Louis Park joined the new Metro West Conference, leaving the North Suburban Conference. Fellow West Metro Schools are Bloomington Jefferson and Kennedy; Eastern Carver County (Chanhassen and Chaska); Richfield; and Robbinsdale Cooper. “The new conference aims to align mid-size schools that share similar demographics and athletic, arts and activities programming from the Twin Cities west and south metro. The new conference also reduces average travel time from 22 miles one-way to 12 miles.